Hello! First of all I want to let you all know how much I appreciate your visits and comments. I am sorry if you don't get a response from me. Google and their changes are driving me crazy. All of a sudden I am not getting any comments forwarded to my e-mail to allow me to respond to your comments. Anywho, today is the beginning of the Where Flowers Bloom blog hop. It's all about flowers from piecing to appliqué, this is the hop to see them all. Carla from Creatin' in the Sticks is our lovely host. I couldn't decide what type of project to make for this hop so I decided that it was easier to use up materials I already have. I recently taught a reversible napkin class which by the way I am trying to get a quick tutorial up for you. 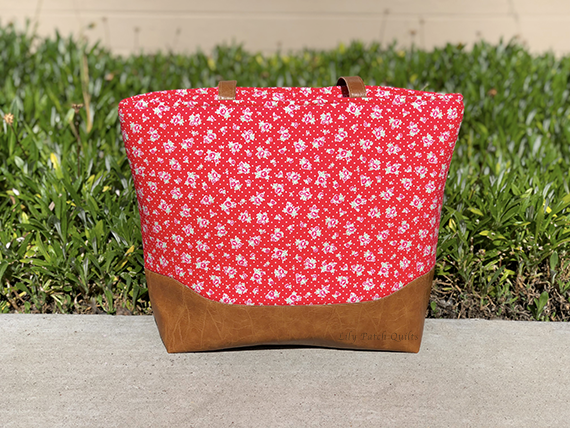 I have a lot of these beautiful vintage floral pieces already cut so I decided to make a bag of some sort. I did not want a lot of scraps left so I used 18x18 pieces to make the bag. I created the bottom leather template and used the leather handles to give it a nice accent and repeal dirt. Here's a pic of the inside of the bag. It has six large pockets and a small one to fit a pen. I LOVE how sturdy this bag is. I also attached a zipper closure that goes all the way around the opening. I figured out an easier way to include the zipper closure and this made me really happy. Thanks for reading my blog and visiting! Enjoy the rest of the hop. I have included the links and dates for all the participants below. So fun to have a new bag for the summer holiday. Super sweet. A wonderful and lovely bag! The addition of leather is a perfect match. 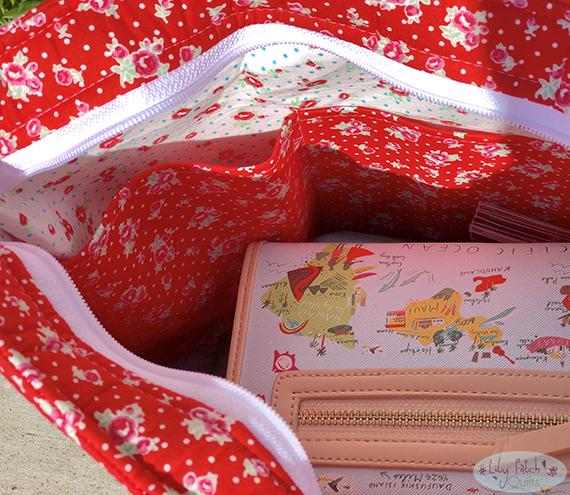 What a charming bag, thanks for sharing! WOW, Kim, this bag is awesome. Such a great project for flowers. Thank you for joining in on Where Flowers Bloom. I'm curious about the napkins too. I'll be watching for that. This bag turned out beautiful! Enjoy your new bag! What a great bag Kim... beautiful fabrics & I love the use of the leather for durability & keeping it clean. You clever girl! Love your large roomy and flowery bag - so happy looking. You should share how you added your top zipper. I have done that but I'm always looking for new and better ways. Wow, Kim. This is a beautiful bag. I really like the combination of the leather and floral print fabric. The inside is smartly designed as well. Such a classy looking flower bag with the leather added...love it! Great summer bag and I do love the leather bottom. Anything that can repel a little dirt is right up my ally! LOL!!! Nice! Love that red fabric! Great bag! I love that the leather handles and bottom will make for a sturdy bag. I tend to overload my bags and they rip. Do you use a special machine needle for sewing the leather? What a great bag, I love it, the leather really gives it that pro looking touch. The inside is just how I like it also, lots of pockets and a closure to boot. Great pattern. Looking forward to the tutorial. Your bag is great, I really like the zipper idea and a pocket for a pen is a must. Mine are always somewhere in the bottom. The leather bottom and straps make it stand out, that is something I have not tried. Thanks for sharing. I love your bag! It is gorgeous! I am having the same problem with google. Do you know how to correct it! Your bag is so pretty and looks so professional! I am a bag lady too and love making bags. That looks like a nice one! Love the leather accents - very nice! Very nice, like the fact it will take a little wear and tare with that leather bottom. 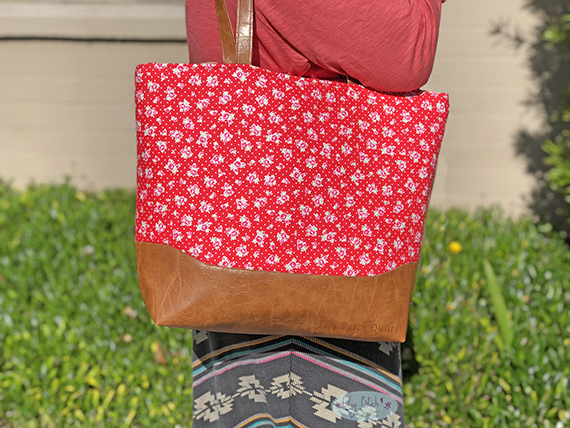 Perfect tote bag for summer activities and shopping! The extra pockets are a necessity for me as I hate having everything sink to the bottom. The red floral is bright and so cheerful! Your bag is wonderful. I love the detail both inside and out. Pen pocket is a great idea. Don't worry about trying to get back to me, I'm fighting the same google issues. What a great bag! I like the addition of the leather to that red floral. It's a perfect marriage of style. Great to include a special pen pocket, too. Love this bag!! You did a great job--lots of pockets, zipper, what else could a woman want? Thanks for sharing! This is an awesome bag! Great job! Thanks for sharing! What a great bag! Thanks for sharing. Very cute bag and perfect to sport some flowers for this hop. Great bag....you can never have enough pockets in a bag. Beautiful bag and how neat that the bottom is leather!